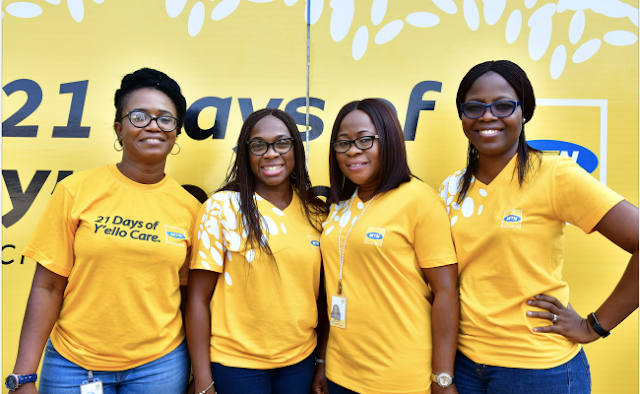 MTN Nigeria began its 21 Days Of Y’ello Care campaign, a volunteerism initiative where all ‘MTNers’ (staff of MTN) across the country will volunteer in various goodwill projects around the country. The annual campaign launched in 2007, is this year tagged “Creating A Brighter Future.” MTN will, for the next 21 days, focus its effort towards ensuring a better quality of life for Nigerians. ‘MTNers’ headed out of their offices for the kick-off of the CSR campaign. And just like previous years, the next 21 days will be utilized for CSR-centred activities. There will be a National Priority Project: Rhesus Disease Awareness; a Career Fair and a Youth Empowerment Campaign. Singer, Chidinma Ekile, was around to add even more color to the event. She sang back to back hits to the delight of the audience. One of the highlights of her performance was when she moved around the audience, taking selfies and bantering with the staff of MTN Nigeria. With all the fun around, the essence of the Y’ello Care Campaign remained at the forefront, Toyosi Akerele, CEO Rise Networks, explained youth empowerment and the effects of giving back to the society.